It’s that time of year again; the witching hour is almost upon us! Halloween is great fun for all the family, it gives you a chance to dress up, eat yummy treats and play lots of spooky games. Halloween otherwise known as All Hallows’ Eve and All Saints’ Eve is a festival celebrated all over the world on the 31st October. The festival is thought to be a Pagan and Celtic festival however it can actually be traced back to Ancient Rome and the Pomona festival which translates as the festival of the dead. The old stories are that Halloween is the day spirits were allowed to return to earth to visit their loved ones, families would set a place for them at the dinner table and a warm fire was always lit to welcome them back, the fires would then continue to burn throughout the night to ward off the devil and any evil spirits. It was around the 16th century when the games we know and love today started to creep into the celebrations. Mumming and guising was a chance for children and adults to dress up and go from door to door reciting old folk songs and poems in exchange for food, if you gave them food it was thought to bring you luck however if you didn’t it was thought to be very bad luck. In 19th century Ireland the children would start to play pranks if they were refused food giving us the trick part of trick or treating, it was also around this time that lanterns were also introduced. Turnips were hollowed out to allow room for a candle to light the way and scary faces were carved into them. In the 20th century they were finally introduced to England, however pumpkins were used instead of the traditional turnips and these became known as Jack O’ Lanterns. Trick or treating is a popular past time of Halloween; however the days of reciting songs and verse have long gone, it was during 1911 in America, trick or treating really took off and sweets were introduced as the treat and continue to be so to this day. There have always been scary supernatural beings associated with Halloween however as we moved into modern times and with more Gothic horror books and films there are lots of spooky characters linked to the festival including vampires, witches, monsters, mummies, skeletons, ghosts etc. Many of these form the basis for the fun dressing up part of Halloween; however it now includes superheroes and princesses too. Halloween is fantastic fun and one the best bits about it is playing games, one of the many traditional games is apple bobbing, this is when a person is only allowed to pick up an apple out of a bucket of water with their mouth, their hands are normally tied around their back to stop them cheating, this game is derived from the old Roman festival of Pomona. Nowadays normal party games are spooked up or the telling of ghost stories and watching scary films is the order of the day. If you’re hosting your own party be sure to dim the lights and decorate the house to make it more atmospheric when telling stories. 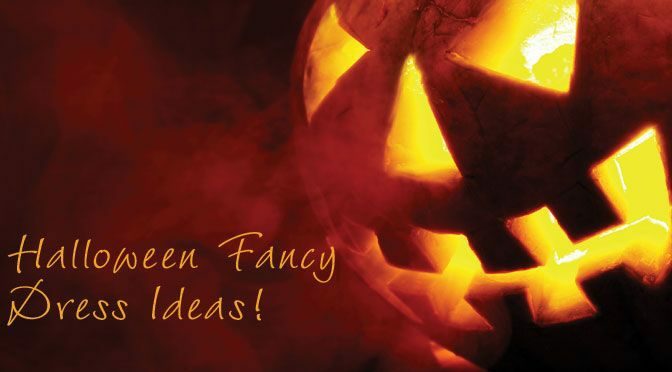 So with lots of fun activities to take part in over Halloween, from trick or treating to parties, the right costume is important, which is where we come in, we have some fantastic and cheap ways to help you dress the kids up and yourselves to make it a spooktacular Halloween…. Before Halloween comes around set aside a couple of crafty weekends, this gives you and the little ones enough time to make their very own costumes. An action packed robot costume can be achieved by using cardboard boxes and space age tin foil, witches and wizards hats can be crafted from sturdy card and lots of magical glitter while scary spiders can be made from black pipe cleaners, the bigger the better. Paper plates are the perfect blank canvas for a monster mask, use paints and pens to add to the look while pretty netting and sequins will kit out your little ballerina. For an even spookier look, use talcum powder on their hair and face to give them a ghostly look and something as simple as a black bin bag can be made into the perfect witches outfit. Don’t forget to look around your home for clothes that can be recycled into a spooky costume, a plain black top and bottoms is the perfect base for some white cardboard bones, simply attach with safety pins or glue and voila you have a fab skeleton costume! A little bit of creativity can go a long way to ensuring they have a fantastic outfit that will also save you money! If the kids are going to be dancing the night away at a monster party or getting out and about for some spooky trick or treating they are going to need the right footwear. For little girls that are dressing up as the popular Frozen Princesses Ana and Elsa a pair of Frozen heeled party shoes are perfect, with lots of sparkly glitter and a comfy heel, they are perfect for a busy Halloween night. For those little witches dressed all in black, a sparkly pair of heeled shoes will give their look a bit of a Gothic twist while star embroidered boots will also keep their feet warm and cosy whist trick or treating. For most costumes a simple pair of black canvas shoes will keep them more than comfy and gives them a base for many different outfits including vampire, cat, bat and many more. The same applies to little boys too; a simple canvas shoe is a great base for all costumes. If they want to dress up as their favourite football player kit them out in some cool footy boots. Are they rocking a robot look? Then simply covering a sturdy pair of shoes with foil will add to the space age look. If you’re feeling creative this Halloween then you can create your very own costume to wow at those scary parties or when taking the kids trick or treating. Whether you want to go all out and knock up an outfit with the help of a trusty sewing machine, update an outfit you already have or simply put something together with items you find lying around we have some fab ideas. A simple pair of black leggings and black t-shirt or body suit can be used as the base for many outfits, from an elegant witch’s cat, skeleton to a unique bat; don’t forget the added extras such as cat ears, bat wings and skeleton bones. For a glamorous witch look, choose a velvet dress and striped tights, plus don’t forget the hat! Not got a velvet dress? Fear not a plain black dress will work just as well. If you want to take it one step further, you can use face paints to create an older looking face or green paints for a classic witch look. Charity shops are fantastic for picking up cheap clothes that you can make into a cool costume, as they don’t cost much they are perfect for ripping and tearing up, this is perfect for when you want a zombie look. If you don’t want to go all out, why not use the magic of makeup to create a scary/spooky face instead, pale foundation or face paint will give you a ghostly look while black eye shadow and lipstick can help create scary sunken eyes and bloodied lips. For your hair, use a dusting of talcum powder for an old greying look and don’t forget to backcomb your hair. For your footwear, the choice is huge. Go for glamour with a pair of heeled court shoes, choose different textures such as matte and patent to give a twist to your otherwise plain black shoes. To go with a witches costume and keep the cold at bay, pick out a pair of heeled boots, these are perfect if you are supervising the trick or treaters, as they will keep your feet cosy on the late October night. If you are hosting a party at home where you are chasing the kids around, a plain black pair of lace up canvas shoes will go with all outfits and keep your feet super comfy. As with our Women’s idea, charity shops are a fab place to look for clothing to go with your costume. If you want the popular zombie look, buying some cheap second hand clothes is an inexpensive way to kit yourself out with a new costume. Tear up a pair of trousers and a top then splatter with fake blood to give you a gruesome look. For a look to rival Count Dracula himself, pick out a smart pair of black trousers and shirt before making your own cape, this can be made from black material or bin bag; don’t forget the plastic fangs and fake blood. If you have a bit more time on your hands, pick up some cheap bandages and wrap yourself up as a scary mummy, tearing them a little will give you an old authentic look. Whatever you choose be creative, you’re more likely to have a unique costume that way. For your footwear, some black pumps will go with all outfits and keep your feet comfy, choose from slip on or lace up. If you are going to be playing the Count this year, a pair of smart shoes will give you that charming, stylish look, choose a pair in black and give them a polish to really stand out. If you are going to be rocking the mummy look a pair of white canvas shoes will sit nicely under your band adage costume without standing out too much. It’s important to be comfortable and black will go with anything. So there you have it, a little bit of background to Halloween and lots of costume ideas. Whether your trick or treating or simply having a party at home, be inventive and creative to achieve a one off costume no one else will have. Don’t forget if you don’t have much planned, decorate the house and buy lots of spooky treats before snuggling up with the kids for a classic Halloween movie such as Hocus Pocus.